Posted April 16, 2019 by Eric & filed under Company News, General News. SonicAire fans that can be purchased and installed from Energy Solutions of Texas help mitigate the dangerous situation of combustible dust accumulation in a number of industrial settings such wood manufacturing plants, metal facilities, laundry facilities (laundromats) and paper processing facilities. These fans help reduce the need for constant cleaning that is required to prevent overhead dust build up in these types of facilities. Check out this new video describing how these fans work, how they will save you money and greatly improve safety. Posted November 13, 2018 by Eric & filed under Company News. Jack Marino, VP of Operations at Kent Moore Cabinets in Bryan, Texas discusses their recent installation of SonicAire industrial fugitive dust control fans through Energy Solutions of Texas (ESOTX). 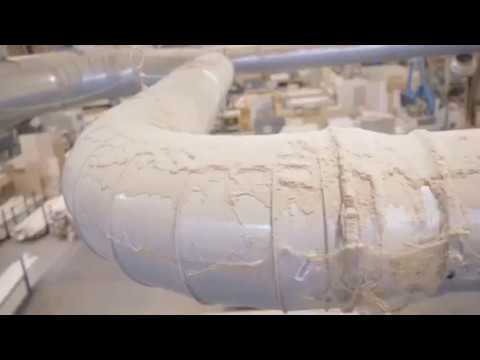 Prior to the installation of the SonicAire fans solution developed and installed by Energy Solutions of Texas, Kent Moore had a serious dust accumulation problem at their main plant. The improvements in plant cleanliness and labor savings for cleaning their industrial plant were dramatic and have already produced a rapid return on investment. ESOTX was able to install the solution with minimal disruption and Kent Moore was able to maintain its production schedule. Posted August 2, 2018 by Kelsie Baker & filed under General News. 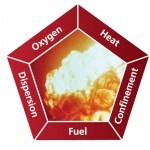 Collector Housing – Housing is continually fed oxygen and there are possible ignition sources from the process side that could cause deflagration. 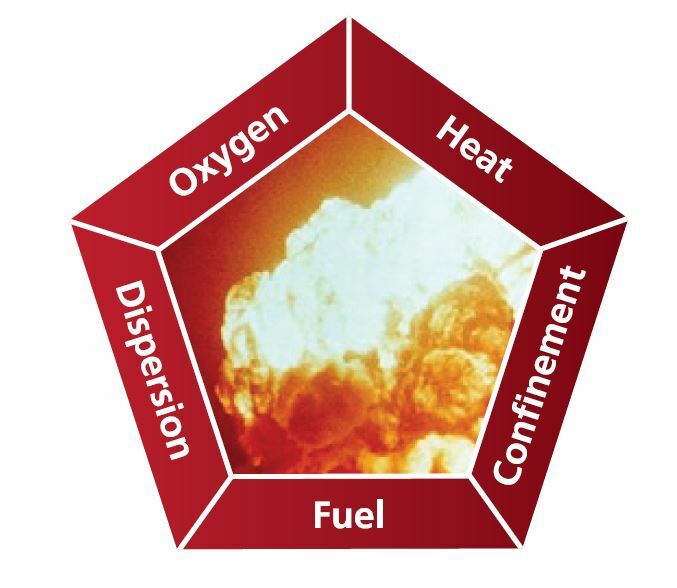 Collector Hopper – Large volumes of dust are directed to the open spaces in the hopper, filters and housing along with the combination of oxygen and ignition sources from housing could result in an explosion. Do not use the hopper to store combustible dust. Inlet Ducting – Improper installation of inlet ducts can cause buildup of dust to result in deflagration. Outlet & Return Air Ducts – Air must be clean when returned to the facility. Without proper safety monitoring and filters, an explosion in the dust collector will travel into the facility through the outlet/return ducts and quickly spread throughout the entirety of the facility. Needless to say, there will be fatalities. Dust collectors only capture 80% of the dust and dirt on the walls, floor, ceiling, rafters and machinery etc. Our SonicAire fans finish the job of eliminating the other 20% of dust that inhibits compliance with the NFPA and OSHA. With the use of BarrierAire proprietary technology, SonicAire fans create an overhead barrier in the facility. The dust is forced to the floor and upward currents are stopped, thus preventing all further accumulation of dust in overhead and hard-to-reach places. Stagnant air that keeps dust in suspension is inhibited by the overhead barrier and manual cleaning is replaced by the continuous cleaning of SonicAire fans. Not only does this save time, but it saves labor costs and loss production costs for many years to come. Often times the ROI for our customers is less than 12 months. We are in the business of saving lives, reducing energy consumption and eliminating fugitive dusts. With our customers, we always recommend that they make sure that their dust collector is in safe working order before we move forward with an engineered design for each facility. For more information on SonicAire fans and our process, please Contact Us. Posted July 12, 2018 by Kelsie Baker & filed under General News. The all new SA XD2 is designed for hazardous locations including Class II, Division 2 environments. For years SonicAire has designed fans specifically for Class I, Division 1 environments as well as others, but now there’s even more that we have to offer as a distributor. Many of our clients use the previously engineered fans already and are looking forward to seeing how this new fan will improve the continuous clean that they have come to know and love. We also offer turnkey solutions for those who would like us to take care of installation from start to finish. 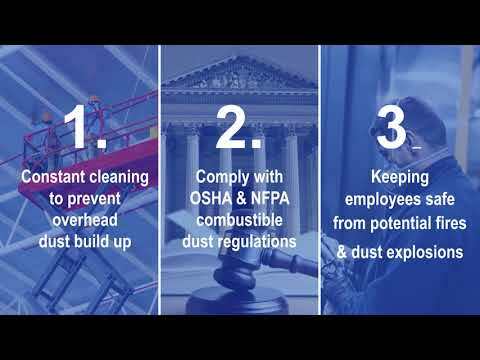 All of our customers know the risk of having dust in hazardous environments and even more so the dangers of ever having combustible dust present. We treat every situation with the utmost caution and understanding as necessary to keep everyone safe, compliant and worry free. UL approved for U.S. and Canada. Voltage – 230,460, 575, 3 phase, 60 Hz. 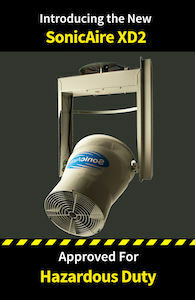 Several industries will be positively affected by the introduction of this new SonicAire hazardous dust fan. A few of the industries that we know are interested already include Food & Grain, Wood Manufacturing, Pharmaceuticals, 3D Printing and Aerospace. It’s our pleasure to bring you and fellow Safety professionals well-known solutions for energy efficiency, NFPA compliance, OSHA compliance, workplace functionality and peace of mind. For more information give us a call at (877) 434-4363 or email us at [email protected]. To download the cut sheet or request a quote click here. 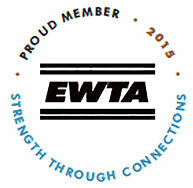 Get involved with other safety professionals by joining our Facebook community Energy Solutions & Professionals. Posted January 10, 2018 by Kelsie Baker & filed under Special Offer. Orion LED fixtures are covered by a five-year limited warranty. Request a quote from the Contact Us page. Posted December 20, 2017 by Kelsie Baker & filed under General News. Posted October 27, 2017 by Eric & filed under Testimonials. We have been very pleased with the Sonic Aire Fans and their performance. While we have a newer state of the art mill and strive to keep dust at a minimum, we have seen the Sonic Aire fans keep the dust at the floor level where we can get to it and sweep it up there. This minimizes the need to use compressed air and also saves labor by not having to manually clean the overheads with brushes. We also like the adjustable cooling feature that the fans have. We normally operate the fans in the cooling mode while the mill is in operation and the fans do a great job of moving air around on the entire floor.